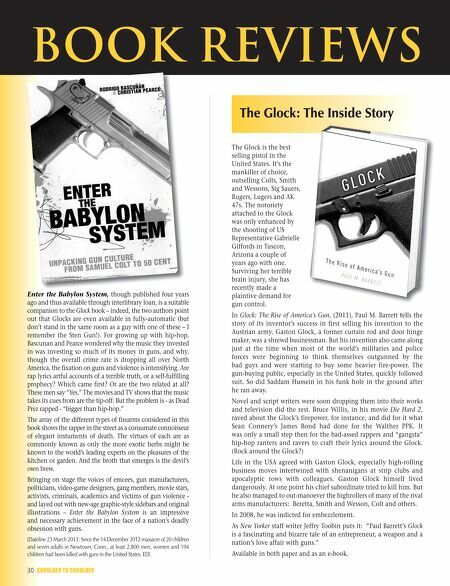 Book reviewS The Glock: The Inside Story Enter the Babylon System, though published four years ago and thus available through interlibrary loan, is a suitable companion to the Glock book – indeed, the two authors point out that Glocks are even available in fully-automatic (but don't stand in the same room as a guy with one of these – I remember the Sten Gun!). For growing up with hip-hop, Bascunan and Pearce wondered why the music they invested in was investing so much of its money in guns, and why, though the overall crime rate is dropping all over North America, the fixation on guns and violence is intensifying. Are rap lyrics artful accounts of a terrible truth, or a self-fulfilling prophecy? Which came first? Or are the two related at all? These men say "Yes." The movies and TV shows that the music takes its cues from are the tip-off: But the problem is - as Dead Prez rapped - "bigger than hip-hop." The array of the different types of firearms considered in this book shows the rapper in the street as a consumate connoisseur of elegant instuments of death. The virtues of each are as commonly known as only the more exotic herbs might be known to the world's leading experts on the pleasures of the kitchen or garden. And the broth that emerges is the devil's own brew. Bringing on stage the voices of emcees, gun manufacturers, politicians, video-game designers, gang members, movie stars, activists, criminals, academics and victims of gun violence and layed out with new-age graphic-style sidebars and original illustrations – Enter the Babylon System is an impressive and necessary achievement in the face of a nation's deadly obsession with guns. [Dateline 23 March 2013: Since the 14 December 2012 massacre of 20 children and seven adults in Newtown, Conn., at least 2,800 men, women and 194 children had been killed with guns in the United States. ED] 30 SHOULDER TO SHOULDER The Glock is the best selling pistol in the United States. It's the mankiller of choice, outselling Colts, Smith and Wessons, Sig Sauers, Rugers, Lugers and AK 47s. The notoriety attached to the Glock was only enhanced by the shooting of US Representative Gabrielle Giffords in Tuscon, Arizona a couple of years ago with one. Surviving her terrible brain injury, she has recently made a plaintive demand for gun control. 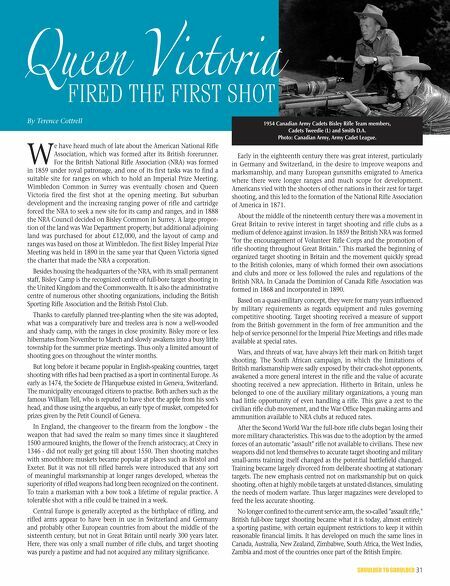 In Glock: The Rise of America's Gun, (2011), Paul M. Barrett tells the story of its inventor's success in first selling his invention to the Austrian army. Gaston Glock, a former curtain rod and door hinge maker, was a shrewd businessman. But his invention also came along just at the time when most of the world's militaries and police forces were beginning to think themselves outgunned by the bad guys and were starting to buy some heavier fire-power. The gun-buying public, especially in the United States, quickly followed suit. So did Saddam Hussein in his funk hole in the ground after he ran away. Novel and script writers were soon dropping them into their works and television did the rest. Bruce Willis, in his movie Die Hard 2, raved about the Glock's firepower, for instance, and did for it what Sean Connery's James Bond had done for the Walther PPK. It was only a small step then for the bad-assed rappers and "gangsta" hip-hop ranters and ravers to craft their lyrics around the Glock. (Rock around the Glock?) Life in the USA agreed with Gaston Glock, especially high-rolling business moves intertwined with shenanigans at strip clubs and apocalyptic rows with colleagues. Gaston Glock himself lived dangerously. At one point his chief subordinate tried to kill him. But he also managed to out-manoever the highrollers of many of the rival arms manufacturers: Beretta, Smith and Wesson, Colt and others. In 2008, he was indicted for embezzlement. As New Yorker staff writer Jeffry Toobin puts it: "Paul Barrett's Glock is a fascinating and bizarre tale of an entrepreneur, a weapon and a nation's love affair with guns." Available in both paper and as an e-book.